Find out how to claim and download the Twitch Prime exclusive Aegean Pirate Pack in Assassin's Creed: Odyssey. If you have Assassin’s Creed: Odyssey and a Twitch Prime account, you may be wondering how to get the new Aegean Pirate Pack. Included in the latest Twitch Prime offerings, the Aegean Pirate Pack boasts a selection of cool cosmetic items that can be used in Assassin’s Creed: Odyssey. Confused on how to get the Aegean Pirate Pack and download everything to Assassin’s Creed: Odyssey? We’ve got you covered! Below, we’ve put together a quick guide on how to get the Aegean Pirate Pack in Assassin’s Creed: Odyssey! To get the Aegean Pirate Pack in Assassin's Creed: Odyssey, you'll first need to claim the offer through Twitch Prime. To get the Aegean Pirate Pack in Assassin’s Creed: Odyssey, you first need to be a member of Twitch Prime. For those unfamiliar, Twitch Prime is a subset of Amazon Prime. If you’re an Amazon Prime subscriber, you can connect your Amazon account to your main Twitch account in order to gain access to Twitch Prime. With this done, sign into your Twitch, then head to the Twitch Prime page to view and access rewards. Note that to get the Aegean Pirate Pack in Assassin’s Creed: Odyssey, players will also need to link their Twitch Prime account to their Uplay account. To get the Aegean Pirate Pack in Assassin’s Creed: Odyssey, simply follow the steps listed below. Log into your Twitch account, then head to the Twitch Prime page. Click the “Claim Offer” button to grab the pack. Link your Twitch Prime and Uplay accounts. 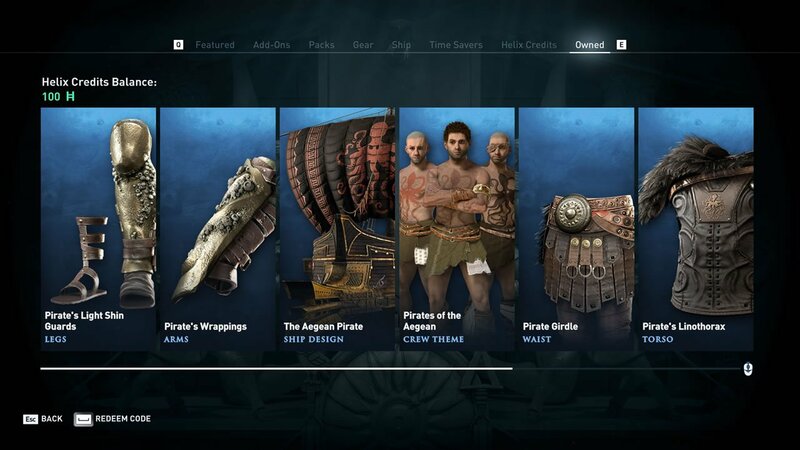 The Aegean Pirate Pack gives you a variety of cosmetic items in Assassin's Creed: Odyssey including the Aegean Atoll. If you completed the steps correctly, the Aegean Pirate Pack should be available in-game. If you’re still having trouble, you can download the Aegean Pirate Pack via the Assassin’s Creed: Odyssey store by navigating to the “Owned” tab. As stated above, the Aegean Pirate Pack is an awesome freebie that includes the Aegean Pirate Gear Set, Aegean Atoll, Aegean Ship Design, and Aegean Crew Theme. It can be yours as long as you’re an Amazon Prime subscriber (giving you access to Twitch Prime), and by linking your Twitch Prime and Uplay accounts together. For more on Assassin’s Creed: Odyssey, be sure to check out some of our previous guides including what Misthios means in Assassin’s Creed: Odyssey, how to use Photo Mode in Assassin’s Creed: Odyssey, and how to craft arrows in Assassin’s Creed: Odyssey. By reading through this guide, you should now know where to get the Aegean Pirate Pack in Assassin’s Creed: Odyssey.